Having a high-quality irrigation system installed on your Northeast Ohio property will allow you to not only keep your grass healthy, it will also allow you to water your lawn efficiently so that you’re not wasting water. However, just because you have a top-of-the-line irrigation system installed doesn’t mean that you’ll no longer have to worry about it. 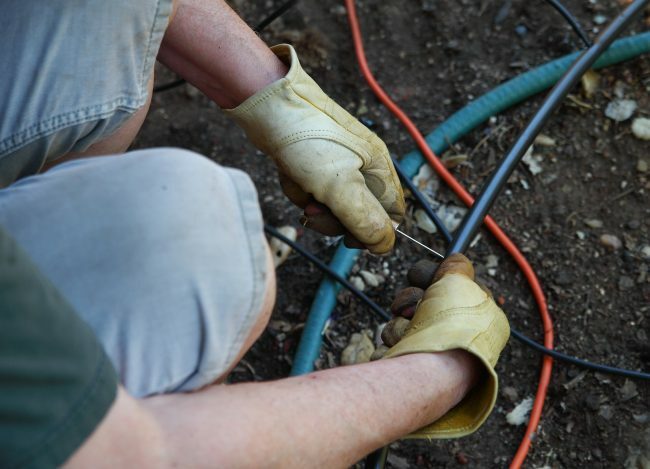 Regularly maintenance is necessary to keep your irrigation system in good condition. Because of this, we highly recommend taking advantage of our seasonal services. Changes in the weather can have a big effect on the condition of your irrigation system, which is why maintenance is often most important — and effective – when the seasons change. We typically recommend getting maintenance done in the fall and the spring, right before the winter season and right after it. Fall is when your Northeast Ohio sprinkler system should be winterized to ensure that it’s not damaged once temperatures begin to drop and snow begins to fall. If water remains in your lines during the winter, there’s a chance that it will freeze if it gets cold enough. This can cause your lines to crack or burst and can be quite expensive to replace. As part of our winterization package, we will turn off your water and drain the lines, drain the backflow device. To ensure that no traces of water has been left in your lines, we will blow compressed air through all zones. Additionally, we will turn off the clock. We can also provide flag heads for fall aeration for a small additional charge. While fall maintenance is essential to help preserve the condition of your Northeast irrigation system throughout the winter season, spring maintenance is also important to ensure that your sprinkler system is ready to get back to work. We will dig out the heads from the freeze and thaw before doing a thorough evaluation of your system to make sure it’s still in working condition. If any of the heads have been damaged, we will replace them. Once the condition of the system has been properly inspected, we will turn on the water and make sure that the sprinkler system is functioning properly in every zone. Without proper spring maintenance, you may not realize that some of your sprinklers aren’t working properly. This can result in parts of your lawn not getting the water it needs as well as in wasted water. When it comes to seasonal maintenance, you’ll want to find a service that not only knows what it’s doing, but that takes great care in making sure that they do the job right. Here at Sprinkler Pro, we focus on building relationships with our customers so that they turn to us for regular maintenance throughout the years. If our reputation for the quality of our work and for our exceptional customer service isn’t enough, we also have numerous accreditations. For example, we are an accredited business with the Better Business Bureau and are members of the Aurora Chamber of Commerce and the Ohio Irrigation Association. Protecting your sprinkler system throughout the year so that it functions properly and efficiently requires that you do regular maintenance before and after the winter system. Because of this, we highly recommend our fall and spring maintenance services. To schedule a seasonal maintenance service in the Aurora or Northeast area, be sure to contact us at Sprinkler Pro today.